Today we are talking about Richard Nixon. 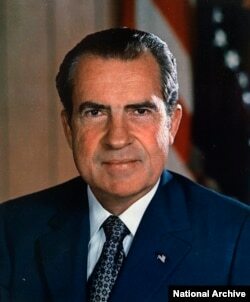 Nixon is well-known to many Americans for one reason: he was the only president to resign from the position. Facing possible legal action by Congress, Nixon left office early in his second term. Nixon’s early political career was marked by success. He also had some noteworthy achievements during his White House years. And he attained his goal of moving the government in a more conservative direction. In his later years, Nixon and his supporters tried to reclaim his place as an expert on international affairs. But for many Americans, the name “Nixon” remains linked to distrust of national leaders, abuse of power, and political wrongdoing. Richard Nixon had a difficult early life. He was the second of five sons in a Quaker family. His parents owned a lemon ranch in California, near the city of Los Angeles. But the family struggled financially. And two of Richard’s brothers died – one as a small child, and one as a young adult. In time, his parent’s business failed, and the Nixons moved to a nearby town. The parents and children all worked at a filling station that sold fuel and other products. Despite the many hours he worked at the store, Richard Nixon was a top student in high school. He was offered financial aid to attend Harvard University, but the family needed even more money to send him there. Instead, he attended a local college, where he became the student body president, joined a debate team, acted in the theater, and played football. Nixon went on to law school at Duke University in North Carolina. Even with his impressive background, he did not get the jobs he sought at the Federal Bureau of Investigation – the FBI – or top law offices. So he returned the California town where he grew up and began working as a lawyer. There, he married another actor at the community theater. Her name was Thelma Ryan, but she was called Pat. The Nixons went on to have two daughters, Tricia and Julie. In 1942, Nixon accepted a job with the federal government in Washington, DC. He did not stay in the position long. 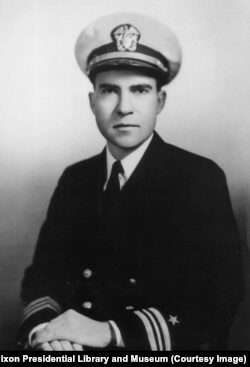 After the United States entered World War II, Nixon joined the Navy. He served as an officer in the Pacific. Nixon helped pay for his first campaign with money he won playing poker in the Navy. When he returned to the U.S., Republican Party officials asked him to be a candidate for Congress. Nixon agreed. He won two terms in the House of Representatives, and then a seat in the U.S. Senate. Two years later, Dwight Eisenhower, the Republican presidential candidate, asked Nixon to be his vice president. 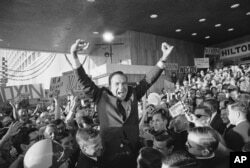 The two men won in an electoral landslide, and in 1953 Nixon took office as vice president. He was only 40 years old, the second-youngest vice president in U.S. history. Nixon’s early political career is remembered for several reasons. One is how quickly he rose to high government office. Another is for his part in the Alger Hiss case in the late 1940s. Hiss was a top official in the State Department. He was accused of being a Communist in the 1930s and 1940s, and of passing information about the U.S. government to Soviet spies. Hiss denied the accusations. The case was big news in the United States. It showed the clash between people who believed Hiss was falsely accused as a way to discredit liberal policies, and people who believed the government was protecting communist sympathizers. Nixon was in the second group. He was part of the investigation against Hiss and pushed for his indictment. Nixon’s efforts succeeded, and Hiss went to jail for almost four years. Later, Nixon said that the case was one of the reasons for his rise to power. The Checkers speech taught politicians the importance of TV in creating a public image. 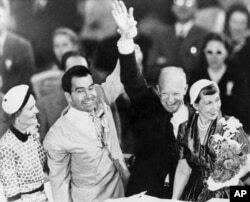 It also helped Nixon and Eisenhower win the presidential election of 1952. They are pictured here with their wives. Nixon also earned national attention with an event that has become known as the Checkers speech. It happened in 1952, when Nixon was running for vice president. 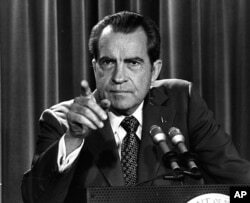 Some reporters accused Nixon of corruption. They said he was accepting money and gifts from wealthy donors in exchange for his political support. Nixon went on television to deny the claims personally. At the time, Americans were not used to seeing politicians speaking directly to the public. Yet Nixon spoke informally and emotionally, from what appeared to be a home. He explained his family’s finances. He said he did not accept campaign donations for personal benefit. But, he added, there was one exception. A supporter had once given the Nixon children a black and white dog they called Checkers. Nixon said he refused to return his daughters’ pet. The public – and Republican Party officials – loved the speech. Nixon appeared warm and likable. Middle-class Americans especially said they could relate to him. Most forgot the claims against him. And Nixon’s political career was saved. During the following eight years, he served as vice president in the Eisenhower administration. But then Nixon’s luck turned. In 1960, Nixon lost as a presidential candidate to John F. Kennedy. He blamed, in part, the media. Then in 1962, he lost his efforts to be governor of California. Yet seven years later, he was in the White House. It was one of the most memorable comebacks in U.S. political history. When Nixon took office in 1969, some Americans thought the country was in crisis. The economy was not doing well. Race riots had been erupting in big cities. Many people were still trying to recover from the violence of a year earlier. Civil rights leader Martin Luther King Junior and President John F. Kennedy’s brother Robert had both been shot and killed. Pollution of the environment was becoming a major political issue. Women were pressing for equal rights. And many Americans continued to protest American involvement in Vietnam. Nixon took action. During his first years in office, he supported reforms and rules to improve the economy; protect the environment; increase workplace and other opportunities for women; support civil rights; and, in his words, bring “peace with honor” in Vietnam. But, for the most part, Nixon did not have the support of Congress to enact legislation. So he expanded the power of the presidency to carry out his goals. He is remembered especially for three foreign policy moves. In 1972, he visited China, with which the U.S. government had tense relations since the Chinese Communist Party took power. As the Alger Hiss case showed, Nixon was strongly anti-communist. But he made establishing diplomatic relations between the two sides possible again. He also visited the Soviet Union, and was the first U.S. president to visit Moscow. Nixon and the Soviet leader, Leonid Brezhnev, agreed to limit the growth of nuclear arms. Their actions helped ease tensions at a time when U.S. officials were worried about the expansion of communism. And Nixon did succeed in reaching a peace agreement with North Vietnamese leaders. In 1973, American troops slowly began to leave the country, although fighting there continued. Nixon’s foreign policy achievements helped him in the 1972 election campaign. His first presidential election had been extremely close; the second he won by one of the widest electoral vote margins in U.S. history. 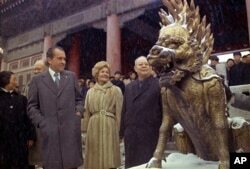 ** FILE ** In this Feb 24, 1972 file photo, U.S. President Richard M. Nixon and first lady Pat Nixon are seen as they visit the tombs of Chinese emperors of the Ming Dynasty, in the suburbs of China's capital of Beijing. Even though he was popular with voters, Nixon had been concerned about his political future. Nixon was so worried that, before the election, he created a secret team to prevent any damaging information from reaching the media. Later, its job expanded to include investigating any information that might hurt his public image. 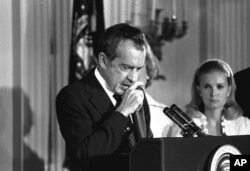 FILE - In this March 15, 1973, file photo President Nixon tells a White House news conference that he will not allow his legal counsel, John Dean, to testify on Capitol Hill in the Watergate investigation. About five months before Election Day, five men broke into the opposition party’s headquarters at the Watergate, a hotel and office complex, in Washington, DC. The team had already stolen copies of secret campaign documents. Now, in the middle of the night, the men were trying to add listening equipment to the telephones – in other words, spy on the opposition. But a security guard became suspicious and called the police. The men were caught and arrested. When the story came to light, Nixon publicly denied that any White House officials were involved in the crime. But in time, the public learned that Nixon was lying. In fact, he assisted with payments to the men who were arrested. And he tried to use the Central Intelligence Agency to block an FBI investigation of the crime. Nixon knew that the Watergate break-in was only part of the illegal or questionable acts he could be held responsible for. Later, people connected with Nixon told investigators that the president had taped everything that happened in his office. Investigators demanded the tapes. They would prove how much Nixon knew about the illegal operations. The president refused. He dismissed the lead investigator. Two other Justice Department officials resigned in protest. A new investigator was appointed, and the U.S. Supreme Court ordered Nixon to release the tapes. At the same time, the House of Representatives voted to remove Nixon from office. They charged him with obstructing justice, abusing his power, covering up a crime, and violating the Constitution. Finally, Nixon released the tapes. But before the Senate could hold a trial – in which the president would almost certainly be found guilty – Richard Nixon resigned. He left the White House the following day. Nixon lived for 20 more years. He wrote a number of books, traveled, spent time with his family, and offered foreign policy advice to other leaders. He continued to deny that he had done anything criminal as president; instead, Nixon said he had made bad decisions. 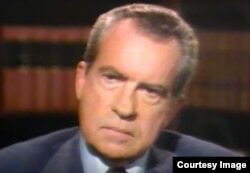 Nixon spoke about the Watergate scandal during a series of TV interviews with Sir David Frost in 1977. They also found that some of his public statements were dishonest. They said he made them to forward his own political goals, not to further the public good. As a result, Nixon’s place in U.S. history is generally thought to be a troubled one. To be sure, he made a number of positive accomplishments, both within the U.S. and internationally.